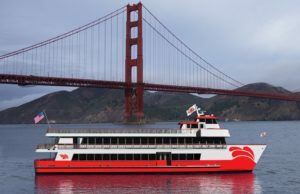 Red and White Fleet is one of the oldest businesses operating in the San Francisco Bay Area. In 1892, a seventeen-year-old Thomas Crowley launched the company by buying a Whitehall boat with $80 he had saved. 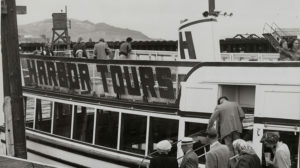 The company’s tour boat business began operations in 1915 to serve the Panama–Pacific International Exposition, a world’s fair held in San Francisco that year. 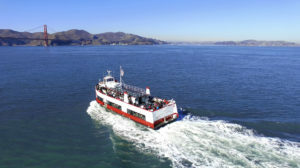 Red and White Fleet is the first –and original– boat cruise business operating in the San Francisco Bay Area, operating since prior to Touring Era. A family-owned company, Red and White Fleet is committed to environmental sustainability and community education. We wish to serve our guests in any way we can. If you have questions or concerns before, during, or after your trip, please do not hesitate to reach out! 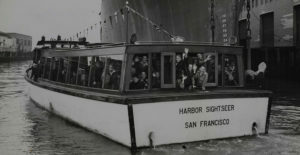 Dating back to 1892, view Red and White Fleet’s long and rich history serving the San Francisco Bay community. Learn more about Red and White Fleet’s dedication and commitment to environmental sustainability and the future of marine propulsion. Explore details about our fleet’s current lineup and see what to expect from each of our vessels to help choose which options are best for you. 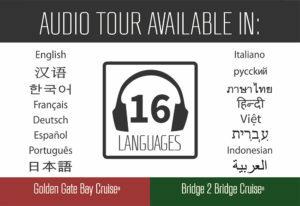 Red and White Fleet offers audio tours in 16 languages: English, Arabic, Chinese, French, German, Hebrew, Hindi, Indonesian, Italian, Japanese, Korean, Portuguese, Russian, Spanish, Thai, and Vietnamese. Need to know how to get here? Do you have any questions about parking or mass transit? We have the answers! Everything you need to know viewing America’s most infamous prison from one of our vessels. Learn a little bit more about what we do and what else we offer, plus some tips and helpful hints on what do once you arrive here.